Featuring a beautifully sinuous design, this stylish ring is crafted in sleek 9ct white gold for a polished finish and set with two rows of sparkling cubic zirconia. Strikingly luminous, this statement piece is destined to become her staple accessory for all occasions. 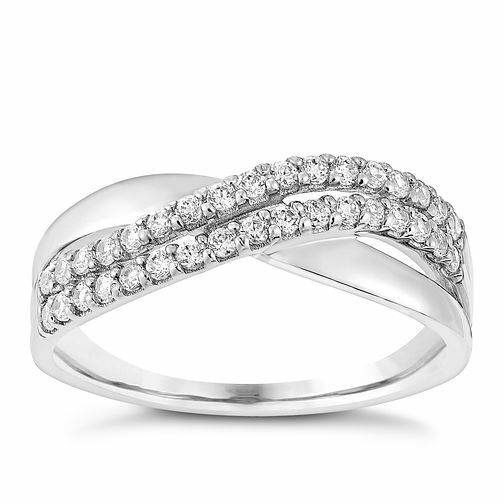 9ct white gold cubic zirconia wave band ring is rated 5.0 out of 5 by 1. Rated 5 out of 5 by Anonymous from Perfect for every occasion Can be worn at any time for a night out or something classy, works with everything and looks beautiful on.